Edgware Road Station, Baker Street Station and Marylebone Station. 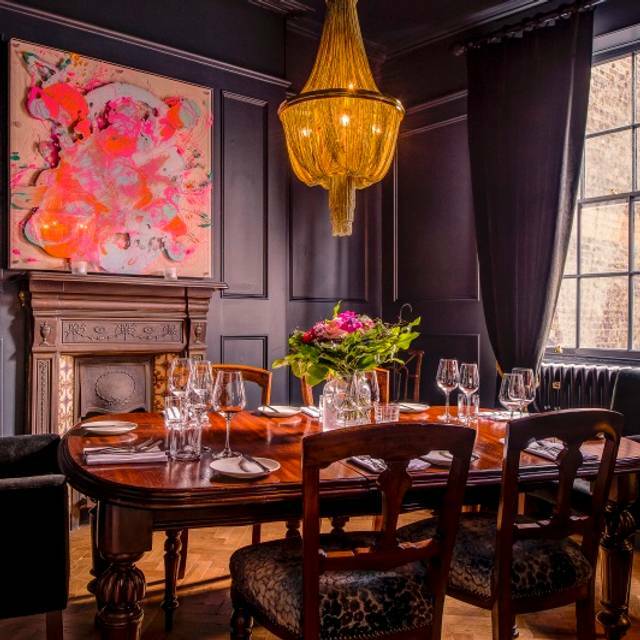 Three diverse private dining rooms are situated upstairs offering privacy in luxurious surroundings with curated art pieces and original furnishings. This beautiful bar and restaurant celebrates its Scandinavian heritage with relaxed, all-day modern-European dining and drinking that includes a nod to Nordic cuisine. 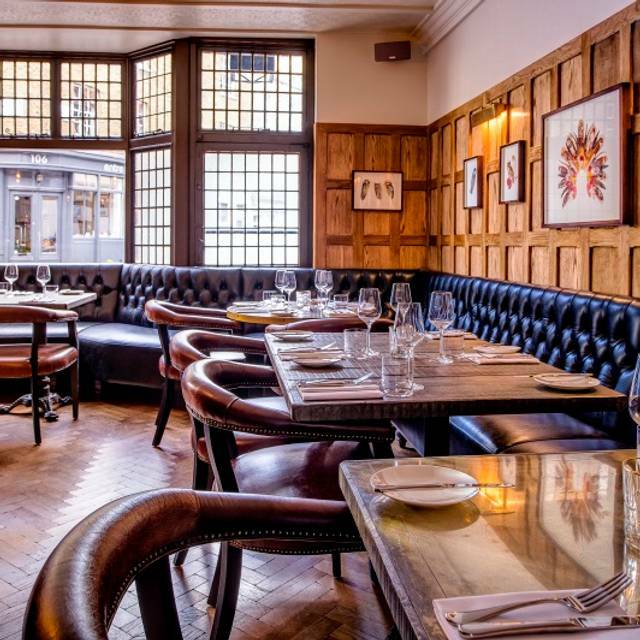 Expect home infusions, house-made cures and tasty pickles which can be enjoyed in any of the various spaces that have retained the original elements of the building. 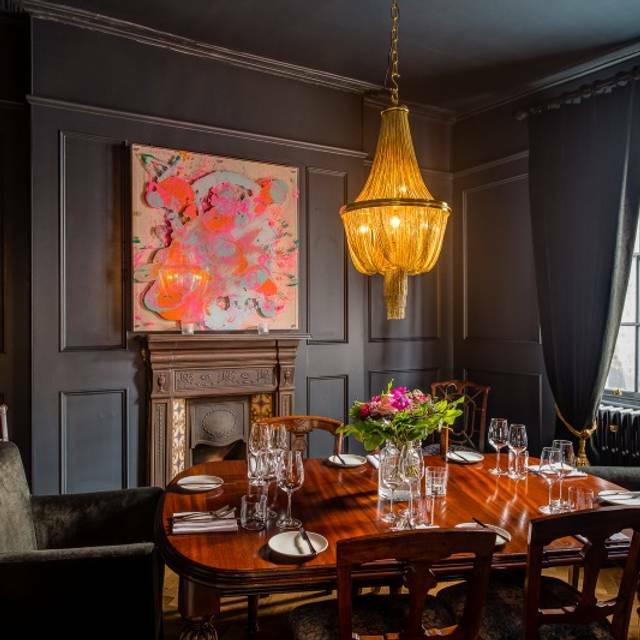 The Oak Room, sumptuous and tobacco scented with a thick marble-topped bar and wooden panelled walls, is where you can enjoy an eclectic mix of Japanese whiskeys and the finest akvavit. 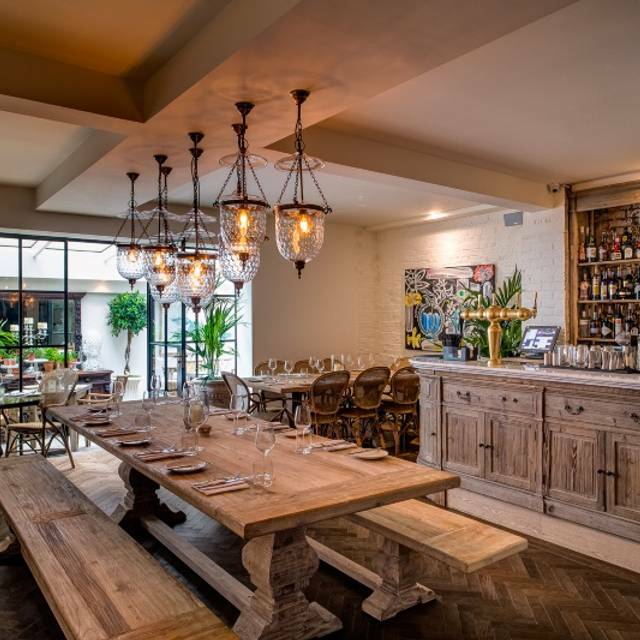 The Garden Room has a calmer, brighter ambiance, verdantly-decorated with hanging plants, lush greens and ivy-coated walls where rotating wine specials will be served. 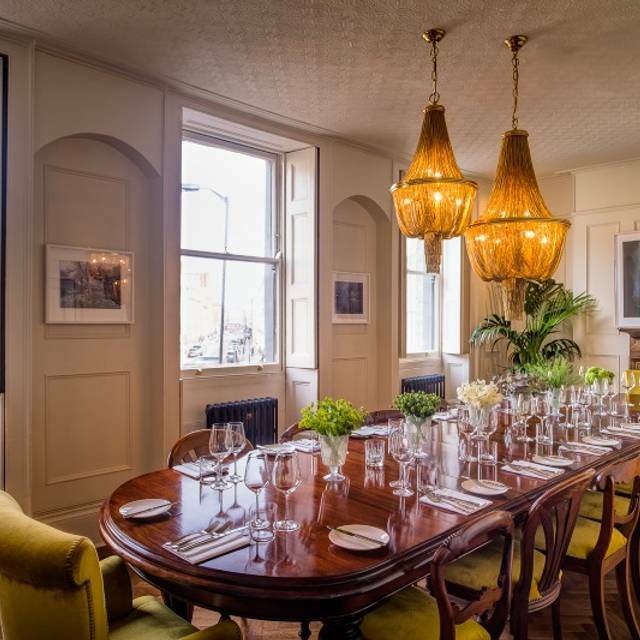 The Summer Room, has a high glass-topped roof conservatory and is complemented by a broodily-lit floor and elegant lighting, and is perfect for a fika (Swedish afternoon tea). The wine have distinct Mediterranean character, while craft beers from across Scandinavia are served. Välkomna! Every dish was stone cold. I think they would have been delicious had they been hot, or even warm! Service was slow. Another excellent lunch . This has to be one of the best Vegetarian plates I've had in along time , Jerusalem Artichokes and Mushroom Jus with greens . Knock out . Fish was excellent . Date pudding again great . Jackpot . Nice decor and pleasant service. the truffle chips are great! Really good food, served creatively. Excellent service in a nice space. nice place in a good location but more French than scandinavian. We were told they have changed menu. We will probably be back someday but will not rush back. 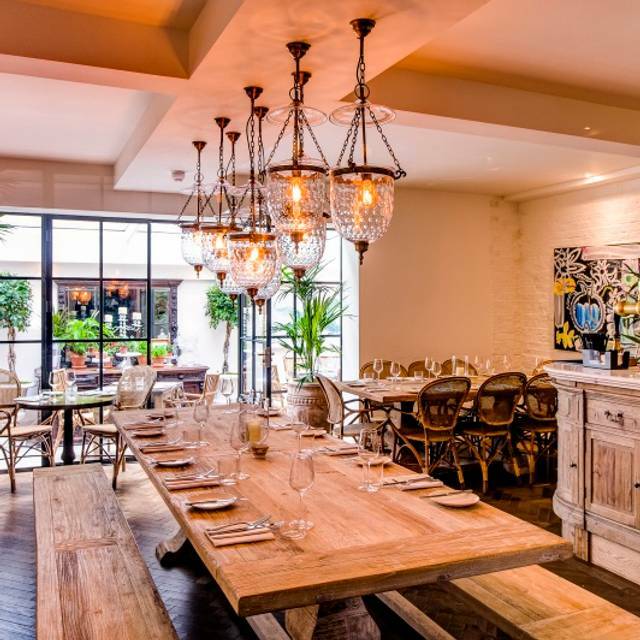 Nice, Scandinavian style restaurant in a quiet street in Marylebone. Well composed menue and wine list. Nice, freindly staff. Completely empty on a Monday lunchtime so totally lacking in atmosphere. Maybe is good when there are a few more customers. Food was fine; fully priced for what it was. Excellent meal with great friends. Whilst the restaurant was not busy this particular lunch time, there was adequate numbers of bar staff and waiting staff to ensure that a nice pint of Timothy Taylor or Lager could be enjoyed by the 4 of us as we perused the very varied menu and buttered the wonderful Scandinavian bread. Being adventurous we were then served starters which included pig's head croquant (deliciously porky tasting) and organic ducks eggs for starters and reindeer (surprisingly tender) and bream (delicately cooked) with a dish or two of the twice cooked truffle chips. We sipped (putting it politely) an excellent bottle or two of Côte du Rhone Villages and whiled away a great afternoon. Recommended! A very pleasant first visit. 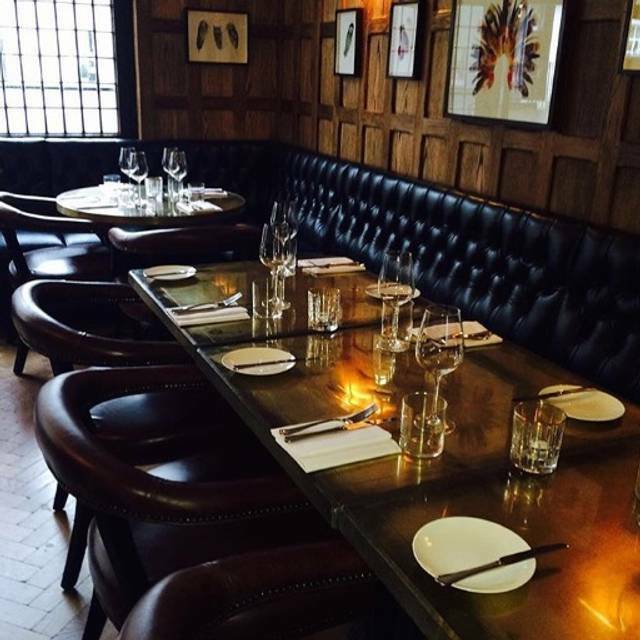 Good ambience and Marylebone location. Excellent service on a quiet Monday, with correct good quality gravadlax and a good, subtle halibut main. Good choice of wines by the glass. Fair value, but no set lunch option, just a la carts. About £50 a head for two courses including house wines and tip. The food at The Harcourt is always very good and it was on this occasion. It being January and the first Tuesday back at work after Christmas, it was very quiet. The service was attentive though which is not always the case in quiet restaurants! I will be back. The restaurant was taking reservations but the kitchen was closed and food was not available. The Christmas menu was excellent and the service too. I had booked a table back in the Summer for Xmas Eve 2018, when we arrived we were rushed to table and told to order quickly because the kitchen was closing (this was at 7pm). I was not informed of this when i booked. The whole experience was absolutely appalling, the bill was excessive they dared to put service charge on the bill when we had not received any service. Food was very good (as expected) though service was poor - slow and with little attention to detail. We hoped to enjoy a quiet evening’s meal, but ambience was rowdy, even somewhat aggressive. We’ll think long and hard before deciding whether to return. Even though I originally made a reservation for 6 people, I called 2 days ahead to ask if they could change my reservation to 8 people, and they said they could add 2 people with no problem. But instead of giving us a table that would fit 8 people they squeezed us in to a table that was very clearly for 6 people, we were very tightly seated and had to eat our whole meal like that. It was not great. We reserved a table for four for lunch and were given one of the worst possible tables. Other parties came in after us, with no reservation and they were shown to much better tables. I think if one makes the effort to reserve via Open Table, the restaurant should make an effort to at least give the party one of their better tables. Really bad service!!!!! From start to finish the service was so bad. I had to ask for water - throughout the meal. We had to find to waitress to make the order. The Oysters didn't come at all. 1 was off. We had to find them to take away our plates - as they were just left at our table for a long time. We wanted dessert but just thought it wasn't worth waiting and finding waiters! We asked for a refill of our wine and the guy came over and nearly poured wine over us and the table - I have never seen wine poured so fast!!! Good choice on the menu and well presented. Found that this visit they did not have enough resources to cover the many customers during lunch time. Wine is over priced for the quantity poured into the glass. We went Saturday lunch time and it was quiet and relaxing. The food was good and service too! Slightly unusual dishes. I had reindeer pie with cabbage and lingonberries. It's a very nice place! Have been here for a special occasion party dinner and for a casual lunch. It's good for both. The home rye bread is super delicious! Totally different menu to website. Had burgers, they asked how we preferred it, we asked for medium, it came back overly well done, dry & tasteless. How does any decent kitchen mess up a burger like this? Worst ever. Avoid. 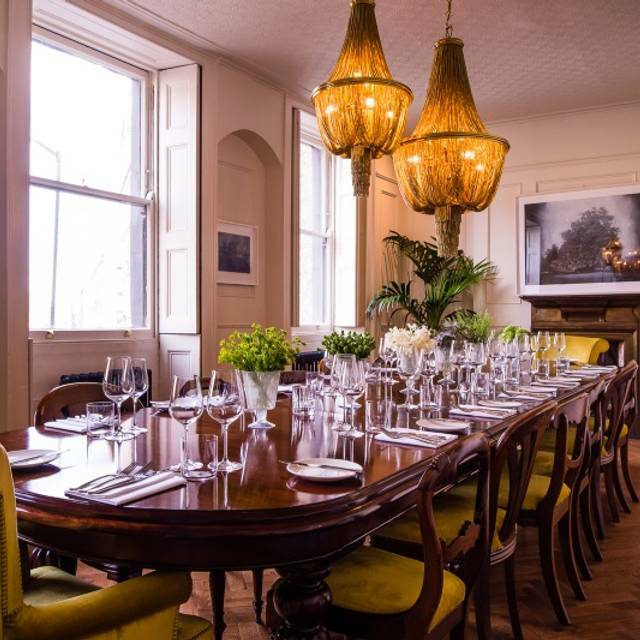 Enjoyed an excellent business lunch with Swedish clients at The Harcourt (party of 6) - recommended! Very slow, poor service. Seemed like there had perhaps been a change of management or staff recently. 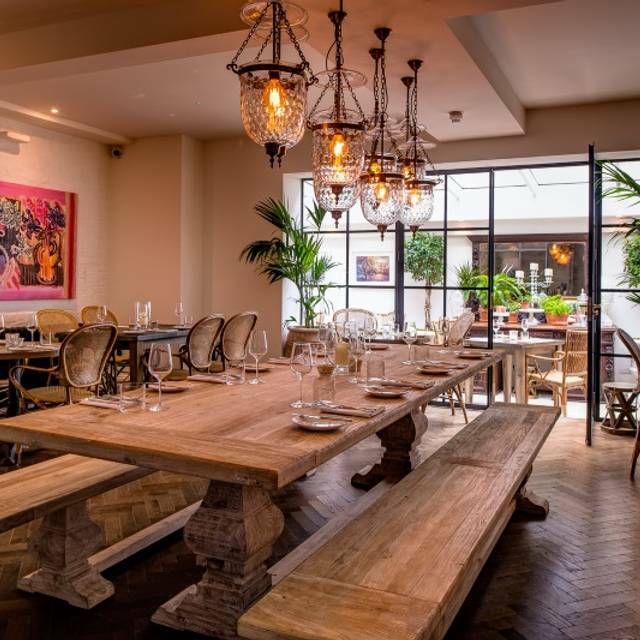 The location is really good for me as close to Marylebone station and has the trendy London vibe. This time, the dining wasn't brilliant. 3 of us ordered the Onglet, cooked well, but served luke warm - obviosuly had sat waiting for the chips to come out of the fryer as they were hot! One of us ordered vegetables, which didn't come until we had all finished our main meal. If we had not needed to leave promptly for the train, we would have had cost removed from the bill. I do like this place and will return, but they need to up their game. Great menu and amazing service! We went for a birthday and we couldn't recommend it enough. It was overall a nice experience and the food was good quality. However, the music played in the bar is at odds with the ambience of the place and if you are going to serve oysters, they should be bought out before hot starters are served not at the same time. Cocktails were really something special, however, half the fish menu was off that night, which seemed a little odd seeing as it was such a featured main on the grill menu and again on the mains. It was actually one of the main reasons I booked the restaurant and I wouldn't have expected it to have sold out by an early evening booking. Other than that food was nice. A cozy restaurant with tasty food and quirky cocktails. Quick and effective service. All in all a pleasant experience. Will probably return another day. My only complaint would be the wine menu for by-glass-wines, which was disappointingly short - something that seems to be the way things are in London, but which I find odd, as a la carte menus are equally common. This restaurant being towards the upper edge on the price spectrum (in our world), I'd have appreciated having a wider range of choices for food-wine-pairing, not wanting to buy whole bottles as we were only two persons and had different foods. In the end we the wines we chose were decent, but not perhaps reaching the same level as the food, which I'm happy to say was excellent. I've been a couple of times and never been less than impressed. The service is always exemplary and the food fabulous. We were there for a business lunch and it is an ideal venue for them. terrible rock drumbeat tasteless and persistent. bad smokey atmosphere from enthused smokers on terrace. Enjoyed the food. The service wasn’t up to a standard that I would expect for the price of the food and service included which was a shame. The food was well presented and tasted very good but we were under the impression that the food would be more Scandinavian, which it really wasn’t. Lovely old pub turned restaurant- posher then Ikea for yummy Swedish meatballs and no flat packs to deal with! The bread is really delicious but don't eat too much of it as you want to save room for the meal. Nice cocktail list as well. Staff forgot about me as I was on my own.